Community Library’s Our Moveable Feast goes to the movies! Read the book but missed the film? Saw the film and want to confirm if the book is better? The Community Library in Ketchum's annual fundraiser is coming up, Sunday, March 11, with the theme of books made into films. Over the next three Wednesdays, the Idaho Mountain Express will feature a brief review of such a book, and Rick Kessler will open his Magic Lantern Screening Rooms in Ketchum to show the corresponding film a day later. 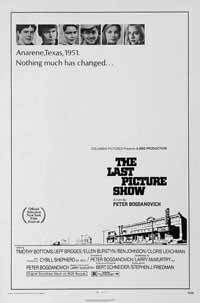 First up: "The Last Picture Show," reviewed here by feast organizer Peggy Goldwyn. The film will be shown Thursday, Feb. 9, at 7:30 p.m.
One of the most seamless instances of a book merging into a movie is "The Last Picture Show." Is that because author Larry McMurtry worked closely with director Peter Bogdanovitch? Is it because the film was shot in black and white about a black-and-white era in a bleak setting? With the recent celebration of the 40th anniversary of the release of the film in 1972 (the novel was written in 1966 and the story starts in 1952), there has been much written reflection about both book and film. One reviewer wrote: "The movie is successful only to the extent that it captures the gentle comedy and elegiac tone of its source material. It is a deeply affectionate book ... and its likeable protagonists ... are deftly drawn." Another remarked: "The grace and gravity of [the book] has never left me. What had left me ... was any clear sense of what the book was actually about." Ultimately, this reviewer concluded that the fully rounded and rich characters—the kindnesses mixed with the bite, the gentle moments contrasting with the harsh realities—are what make the book memorable. The performances in the film are equally nuanced; you don't have to be a Texan to empathize with Sonny, Duane, Ruth and Sam the Lion. They are real and you know them. One reviewer said the book should be reread every decade of one's life. I think the same is true of the film. I saw it again recently, after some 20 years, and I was devastated.